By default, when signing in to your portal, a developer is prompted for their first and last name, an email, and a password. 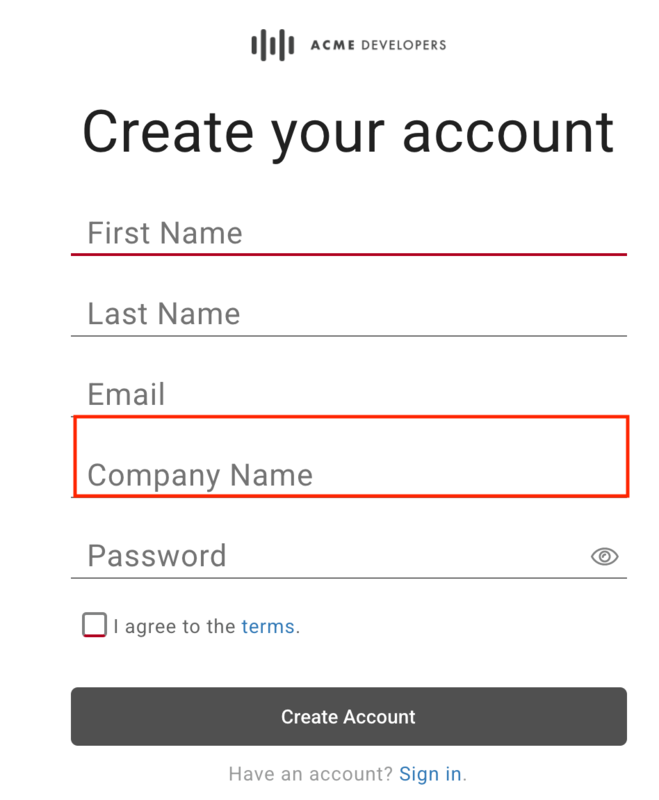 You can add up to three custom registration fields to the Create Account form to capture additional details. For example, you might want to capture the company name. When a developer provides data for a custom registration field, the content is displayed on the Users page in a new column. See Manage user accounts. If you remove a custom registration field, the custom information moves to the Legacy Data column on the Users page. Position your cursor over Show to display the legacy data as a tooltip. Select Settings in the drop-down menu in the top navigation bar or on the landing page. Click the Identity Provider tab. In the Custom Registration Fields section, enter a name for a custom registration field. Select whether the field is Required. Select whether the field is Enabled. Repeat steps 4 through 6 to add additional fields.